^ the best greengrocer in Venezia, near Campo San Barnaba – at low tide! This weekend Enrico and I were invited to Venice by my Woodstock classmate, Jeet, who’s renting a large apartment from Views on Venice, and keeping it filled with friends and family. In all my years in Italy, I’ve only been to Venice twice before, and have never stayed in the city overnight. So this is new and different and fun. We arrived by train from Milan – in this week’s heavy rain, traffic all over Italy is a mess, we would have spent hours on the highway. The train got us right into the city with no car to dispose of, and Jeet’s place on Campo San Barnaba was a simple water bus/vaporetto ride away (we paid 30 euros for the 72-hour ticket, but ended up walking more than riding). NB: We didn’t bring much luggage, a tactic I would advise to anyone travelling to Venice. If you carry more than one piece per head, they charge you six euros extra on the water buses, and it wouldn’t be any fun hauling luggage around Venice. We met Jeet at a caffÃ© in Campo San Barnaba, and he led us back to the apartment, which is comfortably furnished and decorated in a cool, modern style. 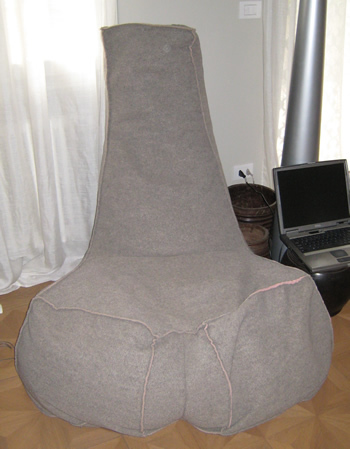 ^ This chair is surprisingly comfortable to sit on… yes, I know what you’re thinking! As always with old friends, the joy is in conversation. We talked at home over wine, talked more over an excellent dinner at the Ristoteca Oniga in Campo San Barnaba: the others had sauteed mussels and clams, followed by roast lamb shank. I had lasagne baked with fresh ricotta and pumpkin, followed by prosciutto di San Daniele with a salad of fresh pears, figs, and arugula – all excellent. The house Merlot wasn’t bad, either. Then home for conversation and cards until past 1 am. I was awoken this morning by the bells of a nearby church, ringing so insistently that I thought it might be some sort of alarm. And perhaps it was. With the heavy rains, the canals had been near to overflowing yesterday, Jeet told us – and then it rained last night. Enrico and I went out, tiptoeing through some spots to avoid flooding our shoes, in search of breakfast – coffee and croissants at a nearby bar. 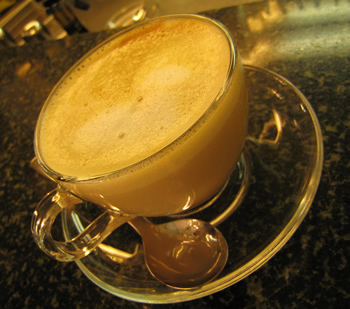 Venice’s own variation on coffee is the macchiattone (“large spotted”); I haven’t quite figured out what that is yet. At this particular bar, both cappuccino and espresso were served in charming glass cups. ^ My first cappuccino of the cool season. We wandered off through the calle, and eventually got on the #1 water bus to return to the apartment. 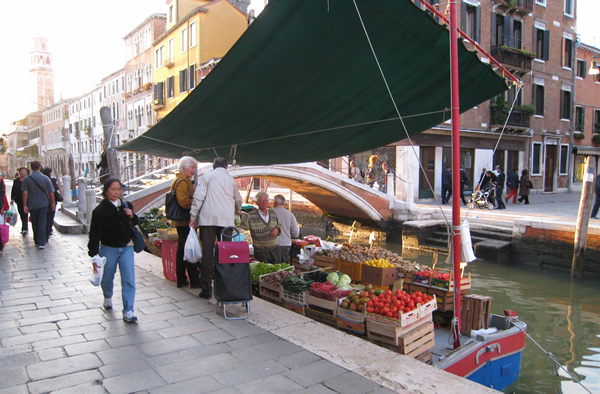 The passerelle (mobile walkways) had been installed at the Ca’ Rezzonico boat stop – the pavement there was under water. The last stretch of pavement between us and home was also now under 8 cm of water. Enrico waded through, I turned back and bought one of the last pairs of rubber boots available from a nearby shop. Is (was) Venice famous for its lace? Burano (one of the Lagoon’s most prominant islands) is (“ormai”, or better to say was) famous for its lacework. Nowadays they can’t find any young apprentices willing to learn the old skills of the trade for the salaries that they can reasonably pay. “Too much work” or “No future in it” seem to be common responses amongst younger Venetian women.